CERRITOS, CA -- (Marketwire) -- 05/31/11 -- Raymond A. Yukna, DMD, MS presented clinical data to a global audience at the International Osteology Symposium to further support the efficacy of the LANAP® protocol in treating moderate to severe periodontitis. The presentation also marks the first time that a University source has compiled a case series review of LANAP protocol results for the treatment of peri-implantitis. Dr. Yukna, a professor of Advanced Periodontal Therapies at the University of Colorado School of Dental Medicine, gathered data from a range of patients treated over the past several years. The FDA-cleared LANAP protocol for the treatment of gum disease utilizes the PerioLase® MVP-7 to clear away infection without the typical cutting of the gums. This results in clinically proven regenerative outcomes, offering patients less post-operative pain and fewer treatment sessions, with quicker recovery times and lasting results. The technique has been used to successfully treat more than 2 million patients worldwide. The purpose of Yukna's poster, titled "Periodontal Bone Regeneration with an Nd:YAG Laser and the LANAP Protocol," is to illustrate radiographic and histologic bone regeneration evident following the LANAP treatment. 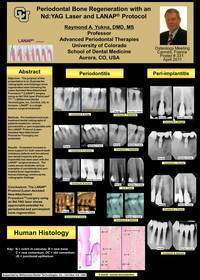 Using pre- and post-treatment dental X-rays from patients treated for chronic periodontitis or peri-implantitis, Yukna's poster shows a consistent increase in bone support for both natural teeth and dental implants following the procedure. "The accumulated research once again shows the LANAP technique to be a progressive approach to treating a major disease that threatens a large percentage of adults," says Yukna. "The data also supports the LANAP protocol as an effective treatment option for peri-implantitis -- another area where the technique could change the way dental professionals treat patients. The results demonstrate appreciable potential for both periodontal and peri-implant bone regeneration." Yukna was the first research periodontist to use the LANAP protocol and is the Project Director for the LANAP protocol multi-centered clinical study being performed at the University of Colorado School of Dental Medicine, two other universities, and two private practices. "The mounting data is encouraging more practitioners to adopt the LANAP® protocol," says Robert H. Gregg II, DDS, co-founder of Millennium Dental Technologies, Inc. (MDT) -- innovators of the LANAP protocol for the treatment of gum disease and the manufacturer of the PerioLase MVP-7 digital dental laser. "Here, Dr. Yukna is offering evidence that the LANAP protocol is effective, and in many ways preferred to the traditional surgical methods used today to treat gum disease. It's also exciting to see the inroads it's making to treat peri-implantitis with some of the same benefits LANAP provides for patients with periodontitis." Information from the abstract is available at www.lanap.com/YuknaCannesPoster.php. ABOUT MILLENNIUM DENTAL TECHNOLOGIES, INC. Headquartered in Cerritos, Calif., Millennium Dental Technologies, Inc. is the developer of the LANAP® protocol for the treatment of gum disease and the manufacturer of the PerioLase® MVP-7 digital dental laser. By providing a simple and comfortable experience with unique bone-building clinical results, MDT's FDA-cleared LANAP protocol removes the fear from gum disease treatment, offering a vastly less painful and less invasive regenerative treatment alternative to conventional scalpel/suture flap surgery; its PerioLase® MVP-7 is a 6-watt free-running variable pulsed Nd:YAG dental laser featuring digital technology and 7 pulse durations -- the most available on the market -- giving it the power and versatility to perform a wide range of soft- and hard-tissue laser procedures. Established in 1990, the company's founding clinicians, Robert H. Gregg, II, D.D.S. and Delwin K. McCarthy, D.D.S., continue to operate the company with a shared vision and purpose: To create better clinical outcomes in periodontal disease patients -- and to remain true to the guiding principle -- "It's all about the patient." For more information, visit www.LANAP.com.